So moving on from yesterday’s super heavy post. Here’s the newness for Halloween 2015. As always, the Dollarbie Hunt! 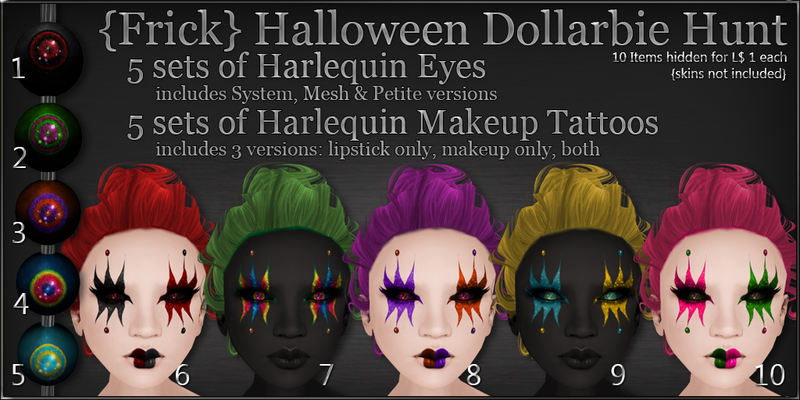 5 tattoo makeups (3 versions, lips only, makeup only & both together) & 5 pairs of eyes (mesh, petite & standard) each in a hidden hat for L$ 1. And a Harlequin Outfit. The outfit consists of mesh skirt in 5 standard sizes, mesh corset in 5 standard sizes, and undies & stockings w/ Omega, SLink & Maitreya appliers as well as system layers. Each color is L$ 50 and can be found both in my shop and on the marketplace.